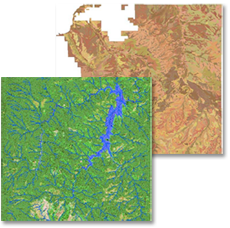 The Geo-spatial interface for WEPP (GeoWEPP) (Renschler, 2003) utilizes digital geo-referenced information such as digital elevation models (DEM) and topographical maps to derive and prepare valid model input parameters and defaults to start site-specific soil and water conservation planning for a small watershed with a single soil and land use for each sub-catchment. The Water Erosion Prediction Project (WEPP) (Laflen et al., 1991; Flanagan and Nearing, 1995) model is a continuous simulation, process-based model that allows simulation of small watersheds and hillslope profiles within those watersheds for assessing various soil and water conservation management options for agricultural, rangeland, and forest sites. The integration of orthophotos, soil surveys, land use maps, climate data, and precision farming data as well as multiple soil and land use within each sub-catchment is currently under development. The goal of the GeoWEPP project is to provide a series of interfaces for users with different levels of GIS knowledge that are capable to utilizing these different data sources in a standard format either provided by GIS users, by precision farmers with Global Positioning Systems (GPS) databases and/or through accessing commonly readily available U.S.-nationwide data sets that are free of charge. Since its beginning in 1999 at the US Department of Agriculture – National Soil Erosion Research Laboratory (USDA-NSERL) and Purdue University, the GeoWEPP project has been a collaborative research project under the leadership of Chris Renschler, now director of the Landscape-based Environmental System Analysis & Modeling (LESAM) Laboratory and Associate Professor at the Department of Geography, University at Buffalo (UB) – the State University of New York (SUNY), Buffalo, New York.